Pets Costs > How Much Does a Cuttlefish Cost? How Much Does a Cuttlefish Cost? 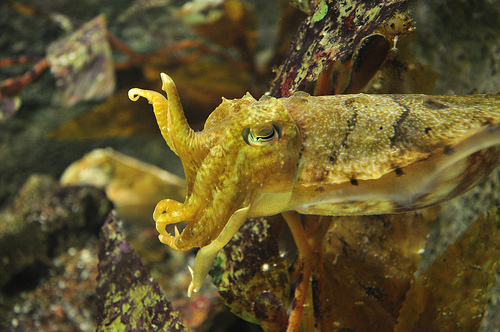 Cuttlefish are known to be great hunters, taking down prey three times their size. Because of this hunting ability, most experts recommend you don’t keep other fish in the same aquarium. On average, plan on budgeting around $120 to as much as $250 for a half-grown cuttlefish about five inches long. The cost will depend on the size and where you purchase it. Eggs and cuttlefish, smaller than one-half of an inch, can cost as little as $15 to $25 each, however. Flamboyant cuttlefish, which can be very hard to find for sale, can cost as much as $75 per egg or up to $300 for one less than three months old. LiveAquaria.com, for example, offers a one to two-and-a-half-inch aquacultured cuttlefish (Sepia officinalis) for $150. Paradise Pet Shop in Wake Village, Texas, offers cuttlefish in groups that can range anywhere from $25 to as much as $1,500. 200 eggs will retail for close to $1,500 while 10 eggs can cost $85. Those who are looking to purchase the cuttlefish as food should be prepared to spend around the same price as calamari and squid. On average, this can be around $5 to $13 per pound. A cuttlefish, even though it has the term “fish” inside of its name isn’t actually a fish, but rather, a mollusk. This intelligent species can change color rapidly, and like an octopus, it can emit ink when being attacked or threatened. It has eight arms, two suckered tentacles to capture food and can grow up to 14 inches long. Depending on one’s preference, a cuttlefish may be bought in egg clusters, as a juvenile or as an adult. Cuttlefish food can be costly and should be budgeted for. Their diet includes brine shrimp, particularly for newly hatched cuttlefish, mollusks, crabs, small fish, octopus, worms, and even other cuttlefish. Crayfish and freshwater shrimp may also be used. If raising cuttlefish from eggs, the best food choice is live mysids since newborn hatchlings will only consume live food. At three months, they can then be fed with marine shrimp and krill. A bag of 2,000 mysid shrimp, for example, can cost about $300. If you are going to raise a cuttlefish in an aquarium setting, you will need to consider the cost of keeping a saltwater tank. The average cost of a saltwater tank with a reef system averages about $30 to $35 per gallon, and experts highly recommend a tank at least 100 to 200 gallons at a minimum. For example, a 200-gallon tank can easily cost into the thousands. You need to think about the maintenance of the saltwater tank as well in the future. If you were to hire a professional aquarium cleaning service, for example, it could start at $1 per gallon, with a minimum fee starting at $75. If ordering online, shipping charges may apply due to the sensitivity of the fish while in transit. Most retailers want to ship overnight to ensure the fish survives upon arrival. This fee, however, may be waived if you meet a minimum spending requirement. Cuttlefish have a very short lifespan and can live as long as one to two years with the proper environment. Cuttlefish eggs hatch in approximately 50 days, depending on the temperature of the water. Since these hatchlings are very small, about the size of a pea, it can take up to three months to see them inside of the aquarium. They can become cannibalistic when food is scarce. If you have more than one cuttlefish, this can be a serious concern. The cuttlefish is sensitive to heavy metals, particularly copper. Aquariums should be made of safe materials such as stainless steel or titanium. When approaching an aquarium with cuttlefish, be careful since a cuttlefish in danger will release an ink cloud in defense. If this were to happen, you would have to change the water immediately to avoid damage or even death. Some experts suggest having 100 to 200 gallons of water per adult as it needs more room compared with smaller cuttlefish, which can be placed in smaller tanks as they grow. There are currently ten species of Cuttlefish, all of which are related to the squid, calamari and the octopus. Raising a cuttlefish is recommended for those who have extensive knowledge. Even the slightest change in the tank can cause their stress levels to rise, sometimes even causing death. If starting out, consider looking for a used saltwater aquarium on Craigslist or even eBay. If you’re lucky enough, you may be able to find someone who’s getting rid of their fish along with the supplies, helping you potentially save more than 40 percent.